The review aimed at assessing the osteopromotive potential as well as soft tissue and temporomandibular joint (TMJ) cartilage healing properties of simvastatin by summarizing its efficacy on the current dental treatment of periodontal bone and soft tissue defects, and temporomandibular joint (TMJ) arthritis from the available animals and human studies. An electronic search was performed on MEDLINE, Scopus, and Cochrane Central Register of Controlled Trials (CENTRAL) using a combination of keywords. A hand search was undertaken on seven oral surgery journals. No limitation of publication year in the English language was placed. Controlled randomized animal and human clinical trials, as well as prospective comparative studies, were included. Data on the comparison of topical/systemic simvastatin on bone healing in intrabony and furcation defects, extraction sockets, distraction osteogenesis, as well as soft tissue healing in mucogingival grafting procedures and cartilage protection in TMJ arthritis were extracted from all the eligible studies. Studies with a minimum of ten participants and follow up at least 6 months were included. Ten animal studies and six clinical studies were included in this study. All the animal studies included a minimum of eight sites per group assessed clinically, histologically, and radiographically. All human studies included clinical and radiological evaluation. The results of the review show that simvastatin administration displays positive treatment outcomes in the full range of therapies investigated in the oral regions such as periodontal infection control, periodontal and alveolar bone regeneration, soft tissue grafting, TMJ inflammation reduction, and cartilage repair. Its mechanism includes stimulating bone formation, promoting soft tissue healing, increasing articular and condylar cartilage thickness, as well as reducing inflammation at surgical sites in TMJ disorders. Simvastatin administration is beneficial to the healing of oral bone and cartilage. More studies are desired to determine its potential in soft tissue healing. Unlike any other type of tissue, bone and cartilage have a complex morphology and exhibit very limited inherent self-repair potentials. Many studies have suggested that a non-union bone gap greater than 25 nm or even only 500 μm always remains after the primary, non-interventional healing depending on the location, vascularization, and the mechanics . Following tooth loss or extraction, without the mechanical stimulus from teeth, alveolar bone naturally degrades to a significant extent thus complicating prosthetic rehabilitation [2, 3]. When sufficient quantity and quality of the alveolar bone is absent, the interventions of dental implants could be complicated at the site for placement of implants because of impaired osseointegration within atrophic alveolar bone ridge. Approaches to regenerate bone include specific grafting surgical techniques with autogenous bone, substitutes, barrier membranes, growth factors, stem cell therapy, and lately the osteopromotive pharmacological compounds. The pharmacological approaches have gained popularity owing to their convenience and the advantageous cost-effectiveness when applied with other grafting techniques. Among all the pharmacological compounds, simvastatin has been well investigated since the 90s for its osteopromotive properties. Simvastatin belongs to the family of statins which are structural analogs of HMG-CoA (3-hydroxy-3-methylglutaryl-coenzyme A). Stains could reversibly inhibit HMG-CoA reductase through side chains that bind to the enzyme’s active site and block the substrate–product transition state of the catalyst. They are originally developed to treat hypercholesterolemia. Commercially available -statin medicines include pravastatin, simvastatin, fluvastatin, atorvastatin, cerivastatin, pitavastatin, and rosuvastatin. Of all the statins, simvastatin is one of the most commonly prescribed drugs . The osteoblast-stimulating effects of simvastatin were highlighted by the breakthrough work of Mundy et al. in 1999. They reported that simvastatin could stimulate bone regeneration and promote bone formation in the mouse calvaria defect model . The mechanism simvastatin-mediated bone regeneration could be attributed to its osteoblast promoting, anti-inflammatory, osteoclast inhibiting, and neovascularization properties [6, 7]. The pleiotropic effects of simvastatin in bone metabolism are associated with its induction of BMP-2 and VEGF gene expression to stimulate the differentiation of osteoblastic cells . Meanwhile, simvastatin was found to inhibit bone resorption by reducing expression of TRAP and cathepsin K, preventing the fusion of osteoclast precursors, and decreasing the number of active osteoclasts . Due to those new findings, the dental clinicians investigate how to reposition this drug to treat alveolar bone, oral soft tissue, and TMJ cartilage defects. We summarized the approaches and findings of these works in this paper and found that simvastatin administration displays positive treatment outcomes in the full range of therapies investigated in the oral regions such as periodontal infection control, periodontal and alveolar bone regeneration, soft tissue grafting, TMJ inflammation reduction, and cartilage repair. Does the result vary with the dosage and what is the ideal dose to be used clinically without adverse effects? Is there any difference in outcome with the route of administration—local/ systemic? What is the role of simvastatin in soft tissue healing? What is the reliability of simvastatin in promoting bone formation with or without the adjunct of bone grafts? 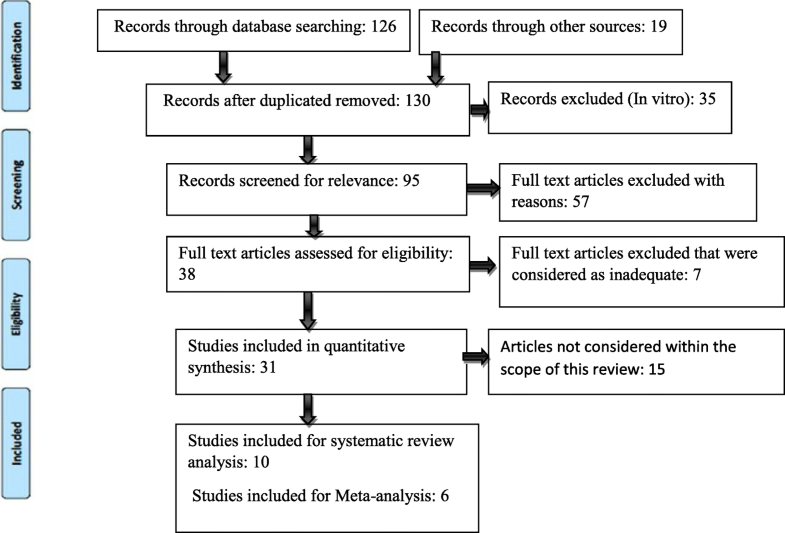 This systematic review was reported following the Preferred Reporting Items for Systematic Review and Meta-Analyses statement (PRISMA) . An electronic search was performed on the following databases: MEDLINE, Scopus, and Cochrane Central Register of Controlled Trials (CENTRAL). The last search was performed on December 31, 2017. The search terms used were “simvastatin,” “statin,” “bone healing,” “bone density,” “osseointegration,” “dental implants,” “bone graft,” “grafting,” “periodontal surgery,” “oral surgery,” “extraction socket,” “tooth extraction.” These terms were combined using Boolean operators OR and AND. Furthermore, a hand search of issues from 2000 up to the last issue available on December 15, 2017, including the “Early view” (or equivalent) section was undertaken in the following journals: British Journal of Oral and Maxillofacial Surgery, International Journal of Oral and Maxillofacial Surgery, Journal of Oral and Maxillofacial Surgery, Journal of Periodontology, Journal of Clinical Periodontology, Journal of Periodontal Research, Oral Surgery, Oral Medicine, Oral Pathology, Oral Radiology and Endodontology. The reference list of the retrieved reviews and the included studies was also searched for possible additional eligible studies not identified by the electronic search. 1. The studies report the results of dental procedures (such as oral surgery, tooth extractions, periodontal treatment, orthodontic treatment, TMJ arthritis therapy, etc.) performed in human and animals, in which simvastatin was topically or systemically used as an adjunct to the standard surgical procedure. 2. The studies provide details on the method of randomization, type and dosage of simvastatin used, the duration of observation, and the report of any adverse effects. 3. The studies compared a test group in which statins were used, versus a control group without using the statins. The use of statins had to be the only difference between the test and control group. The search was limited to oral surgical procedures in animal and human studies published in the English language only. Restrictions were not placed regarding the publication year. Only prospective studies were included. No limitation on sample size was placed. Publications that did not meet the above inclusion criteria and those that were not dealing with original clinical cases (e.g., reviews, technical reports) were excluded. In case of multiple publications relative to subsequent phases of the same study or to enlargements of the original sample size, only the most recent data (those with the longer follow-up and the larger sample size) were considered. Two reviewers (JC and SG) independently screened the titles and the abstracts of the articles initially retrieved through the electronic search. The concordance between reviewers was assessed using Cohen’s Kappa coefficient. In the case of disagreement, a third reviewer (MDF) was consulted. The full texts of all studies of possible relevance were independently assessed by the same two reviewers to check if they met all inclusion criteria. For articles excluded at this stage, the reason for exclusion was recorded. Data were extracted by two reviewers independently (MDF and SG). Cases of disagreement were subject to joint evaluation until an agreement was reached. The studies were initially categorized on the type of animals used for the research as well as in the kind of procedure performed. The primary variables extracted further from each included study include study design, sample size, type, dosage and administration route of simvastatin, type of oral procedure, associated use of grafting (yes/no), type of graft material, control treatment, jaw (maxilla or mandible), follow-up duration, any outcome variable used to evaluate treatment success, outcomes used to assess radiographic, histological, and histomorphometric bone healing. The following methodological parameters were also recorded such as the randomization method in randomized studies, the precise definition of outcomes assessment, and the length of the follow-up period for all studies. The methodological quality of the selected studies was evaluated independently and in duplicate by two reviewers (MDF and SG) according to the above methodological parameters. In the case of disagreement, a third reviewer (JC) was consulted. The risk of bias is assessed based on criteria such as randomization, allocation concealment, blinding of the examiner, completeness of follow-up, and the similarity of groups at the start of the study using modified Cochrane Collaboration’s tool for assessment of bias. When all criteria were met, and no more than one criterion was judged unclear, the risk of bias was estimated as low; if two or more criteria were judged unclear and other criteria were met, moderate risk of bias was assigned; when one or more criteria were not met, high risk was assigned. Besides, the assessment parameters like completion and duration of the study, dropouts, and statistical analysis methods appropriateness were determined to declare the study as adequate or inadequate. The authors of the included studies were contacted for providing clarifications or missing information as needed. The primary outcome variables included changes in hard tissue parameters, such as bone/alveolar ridge width and height, probing depth (PD), clinical attachment level (CAL), radiographic defect fill, and bone mineral density. The secondary outcome variables included the assessment of levels of soft tissue inflammatory parameters at the surgical sites. If two or more comparative studies presented results regarding a similar outcome variable, they were aggregated in a meta-analysis. The weighted mean difference between statin-treated and control group was estimated using a random effect model with the software RevMan (Version 5.3, The Nordic Cochrane Centre, The Cochrane Collaboration, Copenhagen, 2014). Forest plots were produced to graphically represent the difference in outcomes of statin-treated groups and placebo groups for all included studies using defect site as the analysis unit. The electronic search yielded 126 articles from the period 2017–2005. Hand searching found an additional 19 articles. After a first screening of the titles and abstracts, 38 articles reporting results of comparative studies that underwent oral surgery procedures in combination with the use of statins were selected. After evaluation of the full-text of these articles, only 16 adequate studies including 10 animal studies and 6 human studies with low risk of bias were considered for review analysis. The meta-analysis was performed with human studies. Animal studies were not considered for quantitative analysis due to the difference in methodologies, protocols, defect types, animal models, and outcome variables. The flowchart summarizing the screening process is presented in Fig. 1. The characteristics of the included studies are described in Tables 1, 2, and 3. The experimental models used in these studies include rats, rabbits, and beagle dogs. There were a total of ten animal studies. Among them, two studies assessed the effect of systemically administered simvastatin in ovariectomized rats. Vaziri et al. in 2007 determined the most effective dosage of simvastatin (1 × 10−6, 1 × 10−7, and 3 × 10−7 M) for bone formation in ligature-induced periodontitis rat model, whereas Anbinder et al. in 2007 compared the effects of systemic administration of 25 mg/kg of simvastatin with the application of alendronate in both ovariectomized and sham-operated rats for a period of 35 days [11, 12]. Both the studies demonstrated no superior results with simvastatin as compared to controls. Rats sacrificed at 1, 2, 4, 8, and 12 weeks. Group 1 (N = 7), ovariectomy (OVX) plus simvastatin (10–6 M); group 2 (N = 7), OVX plus simvastatin (3·10–7 M); group 3 (N = 7), OVX plus simvastatin (10–7 M); group 4 (N = 7), OVX plus normal saline; group 5 (N = 7), OVX group; group 6 (N = 7), ligature without OVX; group 7 (N = 7), sham surgery without OVX and ligature. Simvastatin inhibits periodontal attachment loss with the least in 10–6 M group. 3·10–7 M had the least effect on the inhibition. Test group: 0.5 mg simvastatin in ethanol (SIM-EtOH); 2) 0.5 mg simvastatin in alendronate–cyclodextrin conjugate (SIM-ALN-CD); control group: 3) EtOH alone; 4) ALN-CD alone; or 5) no injections. Sacrificed at 21 days, 48 days. Local placement of porous HA-collagen grafts with resorbable membranes with or without 10 mg SIM followed by local injections. Experimental group: 2.5 mg/Ml SIM mixed with 0.02 g of gelatin sponge. Experimental group: simvastatin (SIN–25 mg/kg), Active control: sodium alendronate (ALN–2 mg/kg) or Passive control: water (control) orally. II: ETH III: 0.1 mg SIM, 3) IV: 0.5 mg SIM, V: 0.15 mg TH. 8 sinus lifts in sites with < 8 mm available bone. CBCT at 1 week and 9 months to determine the change in bone height and %age of bone loss. SSD in new bone formation of maxillary sinus bone grafting. More in the SIM group. 20 patients, 40 bilateral periodontal intrabony defects. Experimental group: OFD + 1.2 SIM compared to Control: OFD + placebo. GI, PI, PD, CAL at 3, 6, 9 months. SSD decrease in PD. GI and increase in CAL in the experimental group. Bilateral 2-walled or 3-walled periodontal intrabony defects. Regenerative periodontal therapy with bone grafts. Bilateral impacted mandibular third molar extraction sockets. No SSD in facial swelling and pain between both groups. Mandibular molar buccal Class II furcation defects. SSD in PD in the experimental group at all periods. Visual analog scale for pain and discomfort scoring. 4 groups: group I: Simvastatin suspension (S), group II: simvastatin/chitosan gel (SC), group III: chitosan gel (C), group IV: petroleum gel (P). Wu et al. 2008 and Sherif et al. 2016 assessed the extraction and site preservation effect of 1 mg/ml of simvastatin in PLGA gel and 2.5% simvastatin in 1 ml chitosan gel respectively [13, 14]. Both studies concluded that simvastatin is potential to preserve bone height and bone mineral density (BMD). Increase in bone density was reported at the periods between 1 and 4 weeks, while the increase in bone height was only evident at 8 weeks . Killeen et al. in 2012 conducted a study comparing the effects of 0.5 mg of simvastatin with 0.5 mg simvastatin in alendronate-cyclodextrin conjugate on fenestration defects created on molar roots in a rat model . The study highlighted the osteopromotive impact of local simvastatin when used in conjunction with systemically administered alendronate. Rutledge et al. in 2011 compared simvastatin (10 mg) with porous hydroxyapatite collagen sponges applied locally as well as injected in dehiscence defects in dogs. The study demonstrated the ability of simvastatin to induce bone growth at sites of thin bone and edentulous sites . Another study by Ozec et al. in 2007 compared simvastatin (2.5 mg/ml) with gelatin sponges for bone density in critical-sized defects in rats . Healing in closed defects like distraction osteogenesis was determined by Kilic et al. in 2008 in rabbits. The experimental group included simvastatin administered locally in the dose of 2.5 mg/0.2 g of gelatin and 10 mg administered systemically . The human studies included in this analysis showed greater homogeneity in the methodology than the animal studies [19–24]. Therefore, we performed a meta-analysis on these six selected human clinical studies. Of all these six human studies, only one study investigated soft tissue healing potential of simvastatin. All these clinical trials aimed to determine if simvastatin intervention could benefit surgical approaches and improve clinical and radiological parameters. The dosage of simvastatin used in all studies was 1.2 mg except in the study by Gouda et al. in 2017 . In this study, the researchers conducted a split-mouth study comparing 0.1 mg of simvastatin/14 mg of beta-TCP to beta-TCP in maxillary sinus lifts. Although this study included the least number of patients among all the selected studies in this review, it exhibited the strength in extending the follow-up to 9 months after the surgeries. The parameters of all selected studies included the changes in probing depth and clinical attachment levels. Some studies evaluated bone density (gray levels) and bone fill. One study investigated soft tissue parameters. Among them, Kinra et al. in 2010 compared simvastatin (10−8 M/mg of DFDBA) to DFDBA in bilateral two-walled and three-walled defects . Ranjan et al. in 2017 assessed bone formation in intrabony defects by comparing open flap debridement (OFD) and a placebo to OFD with 1.25% simvastatin in the defects . Pradeep et al. in 2012 performed a 6-month prospective study on 72 patients and compared scaling root planning (SRP) to SRP in combination with 1.2 mg simvastatin in class II furcation defects. This study included the highest patient number and the longest follow-up period . Chauhan et al. in 2015 determined the site healing pattern in extraction sockets with 10 mg simvastatin. It also assessed the effects of simvastatin on patients’ comfort, post-op swelling, and pain . Impact of statins on cartilage healing has also been studied in intra-articular-induced arthritis models in rats [37, 38]. The studies suggested that 0.5 mg of simvastatin has the potential to reduce sub-synovial inflammation and inducing new bone formation in steroid-induced bone resorption sites. Two animal studies assessed the effect of simvastatin on the bone height in extraction sockets [11, 13], and one evaluated the changes of bone height in the ligature-induced periodontitis with simvastatin treatment . 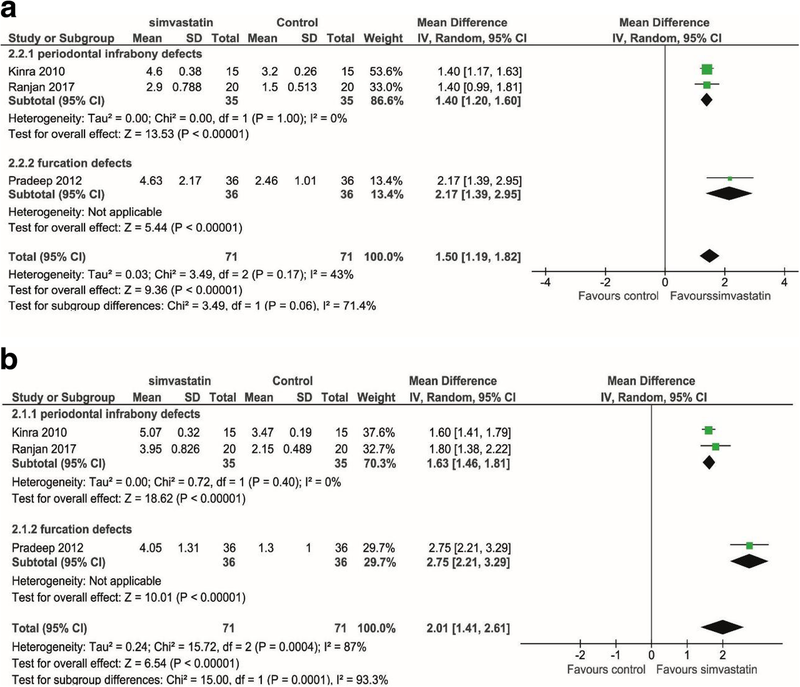 Even though all these studies suggested that simvastatin may have a beneficial effect, due to consistent differences in the protocols, outcome variables, and evaluation methods among these studies, it was not feasible to estimate an overall effect with meta-analysis. Three human studies assessed the changes in CAL (Fig. 2a) and PD (Fig. 2b) in periodontal defects [19–21]. There was evidence of a significant benefit of simvastatin for both CAL gain (mean difference 1.50 mm, p < 0.001, 95% CI = 1.19, 1.82 mm) and PD reduction (mean difference 2.01 mm, p < 0.001, 95% CI = 1.41, 2.61 mm). All the studies favored the statin-treated group. The study by Gouda et al. also showed a significant positive effect of statin on bone height improvement in the maxillary sinus augmentation. But we did not perform a meta-analysis on these topics because it is the only study on such procedure. Four animal studies investigated the changes in bone fill after dental treatment with the use of simvastatin [14–16, 18]. Among these studies, one study was conducted on dehiscence , one on fenestration defects , one study was on tooth extraction defects , and one on distraction osteogenesis . Except for the study on fenestration, all the other studies showed a positive effect of simvastatin, although no statistical significance was reached in two studies [16, 18]. Due to heterogeneity in the protocols and outcome measures, no meta-analysis could be performed to summarize the results of these studies. Three human studies assessed the changes in the width of alveolar ridge evaluating bone fill radiographically [19–21]; we found the significant improvement of alveolar ridge width in the simvastatin group than its control group (mean difference = 1.40 mm, p < 0.001, CI = 0.99, 1.81 mm) (Fig. 3). Five animal studies investigated whether simvastatin application alters bone mineral density (BMD) [11–13, 17, 18]. Vaziri et al. in 2007 measured bone matrix resorption in ovariectomized rats using a dental X-ray unit, and giving densitometric measurement values in mm . Anbinder et al. in 2007 measured BMD in ovariectomized rats with a digital dental X-ray unit, giving optical density values in gray levels . Wu et al. in 2008 measured BMD with dual-energy X-ray absorptiometry (DXA) and provided the results in the unit of mg/cm2 . Kilic et al. in 2008 measured BMD changes in rabbits by peripheral quantitative computed tomography (pQCT) and represented the results in a Hounsfield scale . Ozec et al. in 2007 were excluded from the final analysis because this study did not provide sufficient data . These four studies all showed the mild positive effect of simvastatin on BMD, but without the statistical difference. Due to the methodological differences, it was not feasible for us to aggregate the results of BMD changes using a meta-analysis. Simvastatin was repositioned to anti-inflammatory and osteopromotive purpose recently. Researchers found that simvastatin could accelerate bone regeneration and soft tissue healing by increasing osteoblastic differentiation and stimulating neovascularization via its influence on bone morphogenetic proteins and endothelial growth factor [24, 25]. Statins may also show the anti-inflammatory effect by inhibiting the tissue degrading enzymes like matrix metalloproteinase (MMPs) in rheumatoid arthritis . In the present review, we want to summarize the application of simvastatin in the scope of dental treatments including periodontal regeneration, bone grafting in tooth extraction sockets, distraction osteogenesis, soft tissue healing after mucogingival grafting, and TMJ arthritis therapy. The results of the present systematic review showed that simvastatin has a positive effect on bone regeneration, soft tissues healing, and TMJ articular cartilage healing. Such clinical findings are consistent with the statins’ biological function . For example, the significantly higher alveolar bone level/amount and attachment level in periodontitis patients with simvastatin intervention could be contributed to its synergistic effect of reduced anti-inflammatory response, less soft and hard tissue degradation, and enhanced wound healing potential. The dosage of simvastatin for dental osteogenic purpose varied from as low as 1.2 mg applied locally to 10 mg/kg/day administered systemically. Interestingly, the anti-inflammatory and osteopromotive properties of simvastatin intervention are related to its dose. Wang et al. reported that 5–10 mg/kg/day applied locally in the fracture region supported bone healing . High dose of simvastatin (20 mg/kg/day) increases bone formation, whereas low dose (1 mg/kg/day) decreases bone formation and induces bone resorption . Two human trials in this systemic study showed 0.1 mg simvastatin/14 mg beta-TCP in tooth extraction sockets, and 10 mg simvastatin/2 ml gel foam applied in maxillary sinus lifts increased bone formation [22, 23]. Gutierrez et al. in 2006 determined that the topical application of statin was 50 times more efficient to promote bone formation than the oral administration . While Kilic et al. in 2008 reported no significant difference between the local and systemic application of simvastatin in enhancing bone density in a model of distraction osteogenesis . Rutledge et al. in 2011 reported a 240% increase in bone density with the local application of simvastatin in mandibular defects . However, Kilic et al. reported the bone surface area was higher in the local application group, although it did not reach statistical difference. Overall, timing, dose, administration manner, and schedule of simvastatin are all important factors to be considered how to perform simvastatin intervention in dentistry. From the researches as mentioned earlier, 0.5–1 mg of simvastatin falls within safe limits for intraoral topical applications. The dose of simvastatin to treat the systemic bone loss such as osteopenia or osteoporosis was examined by several studies. Ho et al. in 2009 showed that simvastatin (20 mg/kg/day) enhances bone formation by increasing osteoblast numbers and osteogenic protein expression in ovariectomized rats . This was proved by the increased bone density, bone height, and better bone defect healing by Vaziri et al., Anbinder et al., and Junqueira et al.’s study [11, 12, 32]. However, Anbinder et al. reported no statistical difference was found when systemically administered 25 mg/kg/day simvastatin with alendronate (2 mg/kg/day) in ovariectomized rats . Therefore, based on all currently available studies, we cannot draw a clear conclusion about the dose and intervention pathways for either local or systemic administration of simvastatin for our dental treatment. More studies are required to optimize its clinical administration. Simvastatin is a lipophilic drug. Hence, to increase its absorption at the local sites and to delay the release of drug thereby achieving a sustained release, simvastatin is usually mixed with carriers like ethanol, chloroform, and methanol , or mixed it with bone graft materials such as DFDBA and beta-TCP [19, 23]. Nyan et al. in 2009 and other research explained the burst release phenomenon of simvastatin from the graft particles on the first day followed by slow release. This is advantageous as the optimal dose of the drug stimulates local cells to express BMP-2 without inducing the inflammatory reaction [33–36]. Another reason to use carriers is for space maintenance, for which thermosensitive materials are usually considered. These materials change their form from liquid to semi-solid, which aids in retaining the drug at a specific site for a longer duration of time. Hence, one of the aims in the present systematic review was directed at determining the outcomes after the administration of simvastatin with and without a carrier. Studies by Sherif et al., Holwegner et al., and George et al. [14, 37, 38] reported no statistically significant differences in their results between the two groups. Rutledge et al. and Ozec et al. [16, 17] have used gel foam and collagen sponges as carriers with simvastatin to determine, if any advantage was obtained, with the use of respective compounds. Rutledge et al. in his study reported that the use of ethanol prevents the backflow of the drug compared to carriers like methylcellulose due to their thermosensitive property. Also, in the same study, they compared the effects of simvastatin on bone formation with or without the adjunctive use of bone grafts. Though they observed a significant difference in the bone formation between the two groups, the results were not statistically significant. Sherif et al. in his paper further commented that there is no definite consensus on the indications for the use of carriers and it is determined by the type of surgical procedure. In the present review, we also review the study investigating simvastatin intervention on the healing of articular cartilage. Two recent studies determined the outcome of simvastatin injections on experimental temporomandibular arthritis in rats. In one of the studies, a dose of simvastatin compared was 0.1 and 0.5 mg, whereas in the other study, 0.5 mg of simvastatin was compared with the 0.15 mg of triamcinolone hexacetonide (steroids) injections [37, 38]. The period for assessment was 28 days in both. Both the studies concluded by agreeing on the anti-inflammatory property of simvastatin. It was also suggested that simvastatin could preserve normal condylar growth of cartilaginous tissue, if not additive to the present extension. Also, 0.5 mg was found to be better than 0.1 mg in reducing retrodiscal inflammation which collaborates with the previous studies on the comparison of various doses of simvastatin. The study had recorded that 0.1 mg was associated with the least inflammatory reaction. However, there was increased bone formation and anti-inflammatory effect with 0.5 mg simvastatin [33, 39]. The soft tissue healing potential of statins has also been established in a very recent study by Madi and Kassem . The study assessed palatal healing with simvastatin and chitosan combination (10 mg/ml) after free gingival graft procedure. A visual analog scale determined pain discomfort at various time intervals up to 14 days. Pain scores were comparatively reduced with simvastatin at 7 days as compared to the control group which consisted of simvastatin and chitosan alone. It was concluded that the topical application of simvastatin and chitosan gel could be used as a novel therapeutic modality that improved healing and reduced pain in the palatal donor site following the FGG procedure. There are certain limitations noted in the current analysis such as (1) only 16 studies were included for the analysis based on a strict selection criterion, (2) studies had small sample sizes, and (3) different study designs which led to calibration error while documenting the results. However, the present review draws its strength from the strict selection bias and selection of the studies with conclusions drawn from the long duration of follow up. The data from the available studies suggest that simvastatin alone has a promising potential for alveolar bone regeneration in the optimal dose of 0.5–10 mg depending on the route of administration. The use of simvastatin with other bone grafts poses an additional advantage. However, there are contradictory results in literature; hence, more studies are needed for the same. A definitive consensus could not be reached on the use of carriers with simvastatin, and the usage of the carrier is determined by the site and type of surgical procedure. Despite positive outcomes for the healing of gingival graft, more clinical studies are needed to support the use of simvastatin for this application. This study is supported by the UFCD start-up grant to Dr. Jia Chang #00127658. JC and SG performed the search, conducted the review, and drafted the manuscript. MDF assisted in assessing the studies, carried out the editing of the manuscript, and helped in the manuscript drafting. SG and MDF designed the systematic review and performed data extraction independently. All authors read and approved the final manuscript. This review was executed by PRISMA (Preferred Reporting Items for Systematic Reviews and Meta-Analyses), and no approval by an ethics committee was required. Swati Gupta, Massimo Del Fabbro, and Jia Chang declare that they have no competing interests.